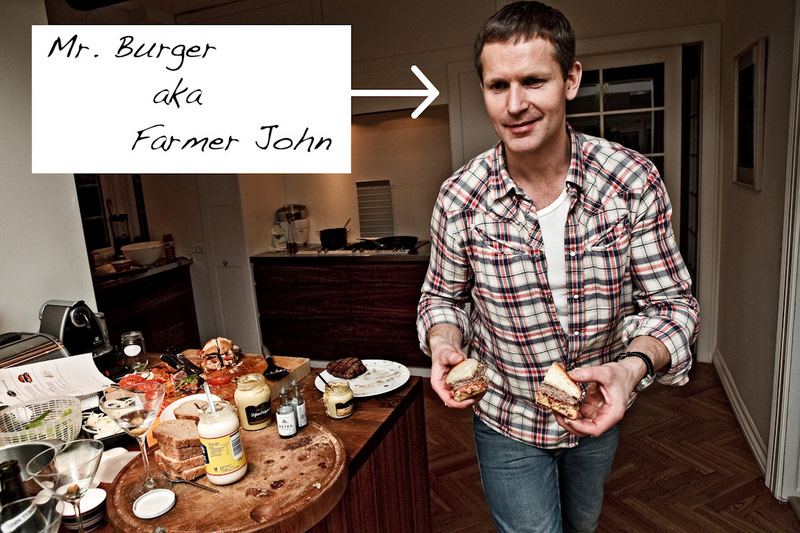 The Doctor in the Kitchen: THE GREATEST CHEESEBURGERS OF ALL TIME? Hamburgers are great food. There is just no way of getting around that. It is a fact – not up for dispute. I find it at times baffling how good a sandwich a hamburger really is, after all it is just some ground beef stuck between a couple of slices of soft tasty bread, fresh vegetables and some sweet ketchup and hot mustard, maybe a pickle - wait a minute that is a description of a wholly gorgeous meal! But sadly the hamburger has its dark side – or has been taken over to the dark side? Fans of MacDonald's and Burger King can quit reading right here – 'cause this blogger has absolute contempt for those establishments and what is peddled under their name! I will not argue this statement further as I feel that it is clear to all those who share my view! 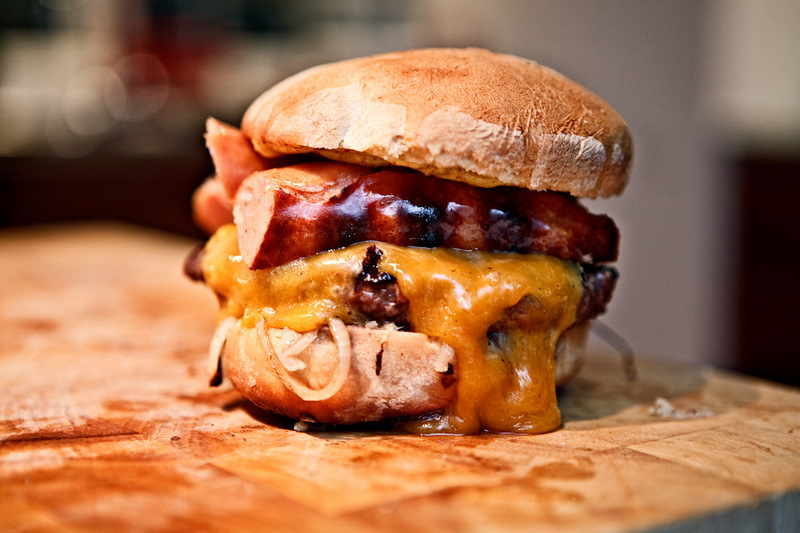 But enough about that – lets take a glance at some real hamburgers. Not so long ago I was invited to a friends house who lived in Denmark for an amazing dinner party. It was quite interesting how the whole thing came about. Shortly before the dinner party I had surfed upon a website which Wisconsin cheese producers are responsible for - THE CHEESE AND BURGER SOCIETY OF WISCONSIN. There they proclaim the ever-going and ever-growing love affair between the hamburger and its cheese. 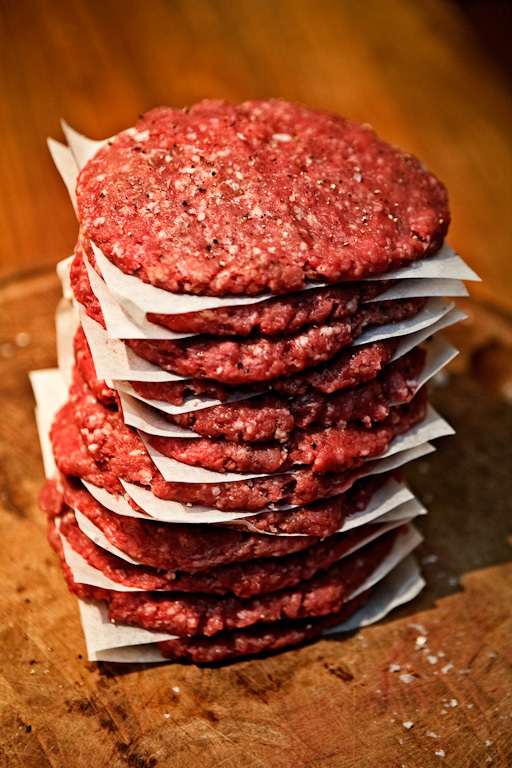 They present many different types of cheeseburgers in a curious and exciting manner – for those who are interested, take a look at: www.cheeseandburger.com. Anyways, I showed this site to this friend of mine, and he to his friend and after some extensive research this friend of mine invited us all to his house for a magnificent cheeseburger feast. He took his task very seriously and cut no corners and spared no expense. I considered myself very lucky and honoured to among the chosen ones to partake in the whole affair! After dissecting the Wisconsin website and a round table discussion these burgers were chosen as test subjects for the evening in question. This became an extremely enjoyable collaboration. My friends, Kristinn and Teitur had aquired all raw materials for this feast. We all worked together in the kitchen. I made the hamburger buns, the meat patties, the Rosti potatoes and onion rings. Teitur cut down and sorted all essential extra materials and took all the photos. Kristinn was the evenings host and grill master. Others were on beer duty (so were we but who’s counting?). We drank, ate and were merry – very merry! 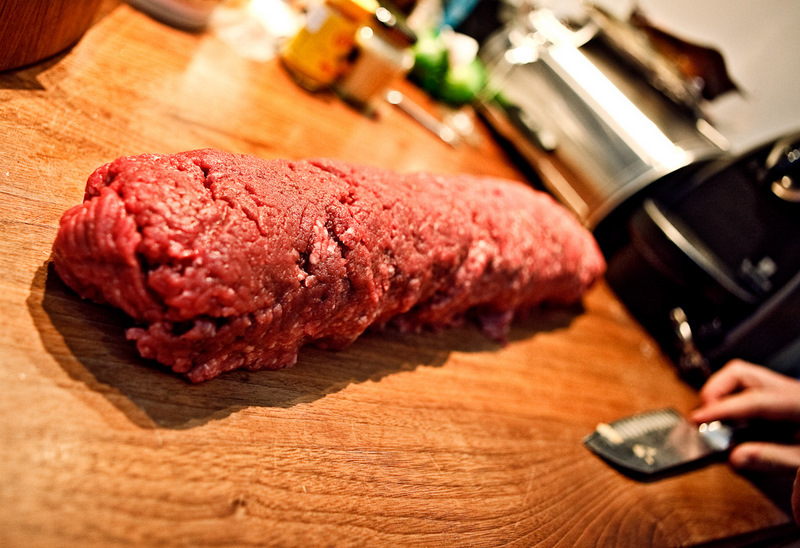 Freshly made ground beef from a good butcher is the best! Kristinn had bought a heavy load of freshly ground beef from his local butcher. The meat was ground down to order ”live”! It was kneaded into a large sausage, divided into juicy patties and then seasoned generously with sea salt and freshly ground black pepper. Well seasoned with sea salt & freshly ground pepper - ready to go! In my opinion when you have meat of this calibre flavouring it with a lot of spices is unnecessary. Not that it's a mistake, not at all. 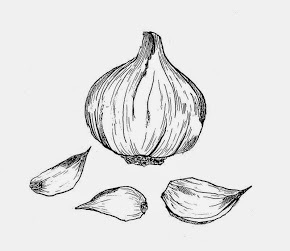 They can easily be flavoured with any kind of onion, breadcrumbs, various spices, chili and what not. 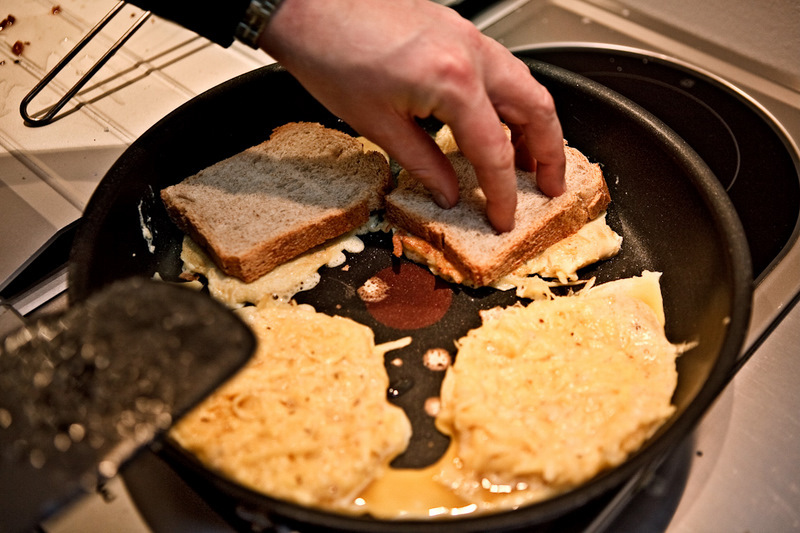 But we decided to have a basic approach with only salt and pepper. 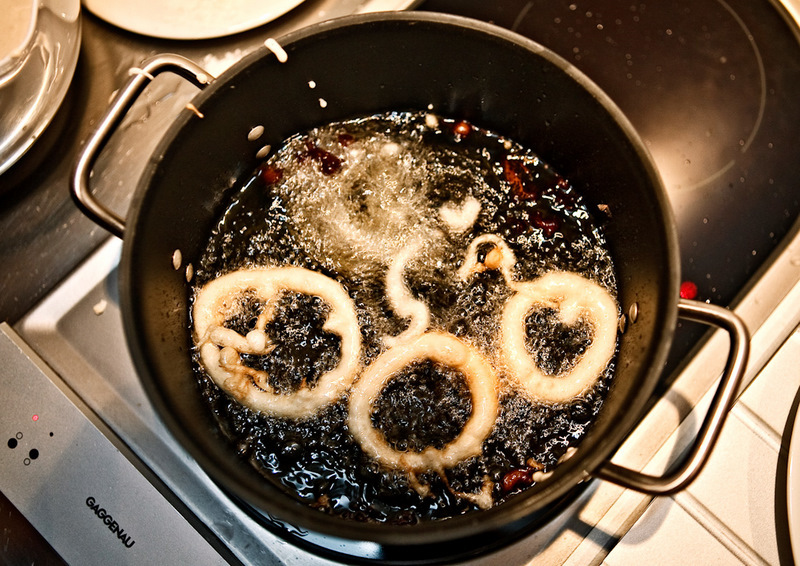 A few onion rings sizzling away on the hob! I made a simple batter for the onion rings. A cup of flour was poured into a bowl, teaspoon of the following; salt, baking powder and ½ teaspoon of bicarbonate of soda. Then 2/3 of a bottle of good beer was added to my dry ingredients. Mixed together until you have a thick batter on your hands. 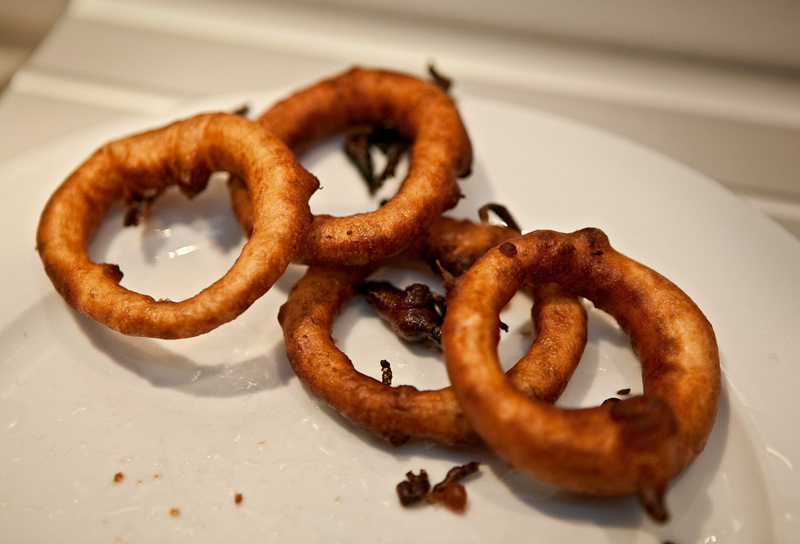 Chrunchy onion rings - these are the sweet sins of life! First dip the onions into some seasoned flour, then the batter to coat them, pick them up with a fork and the carefully place them in the hot (180 degrees) oil and fried until golden brown – or a little more. The making of the Rosti potatoes! THE FARMER JOHN ..not for the guy who makes spreadsheets for a living. For the first cheeseburger, the Farmer john - the recipe called for some Rosti potatoes. We grated some potatoes, squeezed out the moisture (with our bare hands I say! 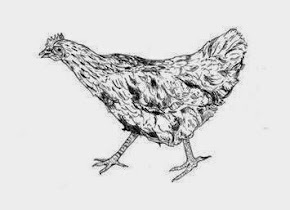 – we were feeling rather macho at this point), mixed with some beaten egg, salt, pepper and then fried them in a dash of oil. 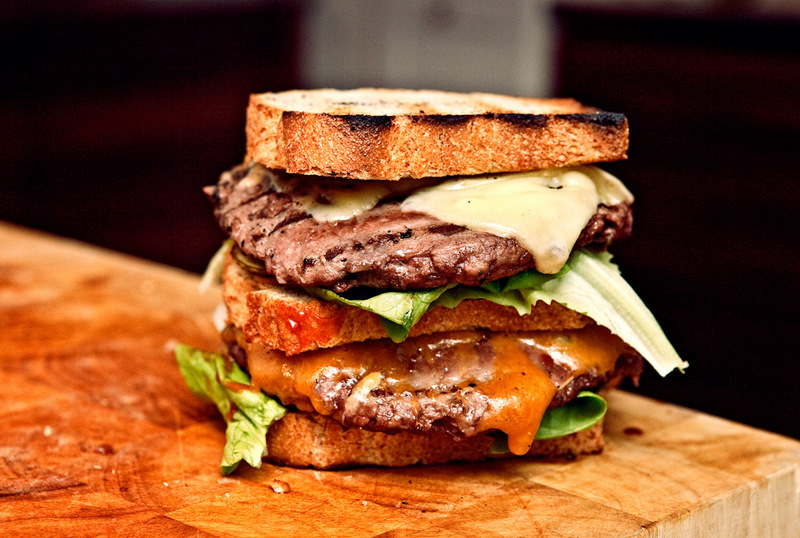 It is a thick and mighty hamburger loaded with various goodies. According to the recipe - we should have used Limburger cheese, which is a potent cheese with a mighty scent and flavour. But that was unobtainable in Denmark so we used some Port salut cheese we considered an appropriate substitute! 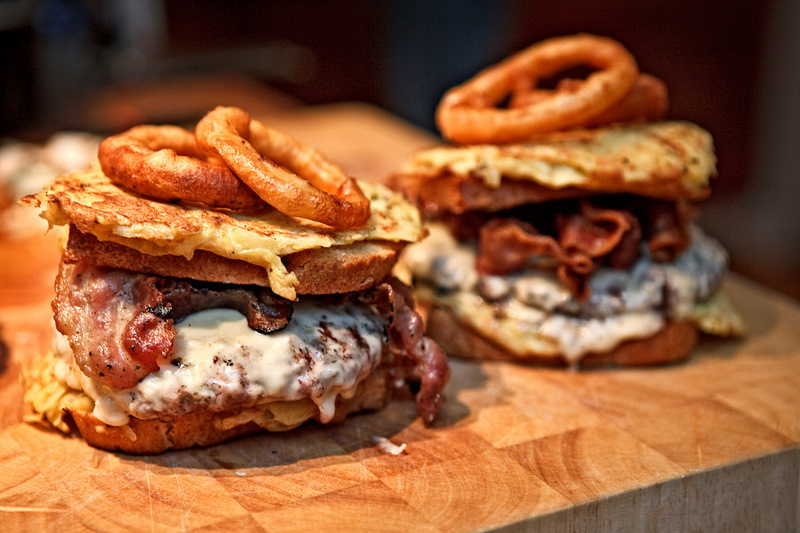 So there you go - some rosti potatoes, some bacon, potent cheese garnished with a couple of onion rings! This one is a double Decker with thick slices of both white and yellow cheddar cheese piled on two meat patties, toasted white bread, yellow mustard, white onions, ketchup, mayo. OMG - this burger was heavenly! 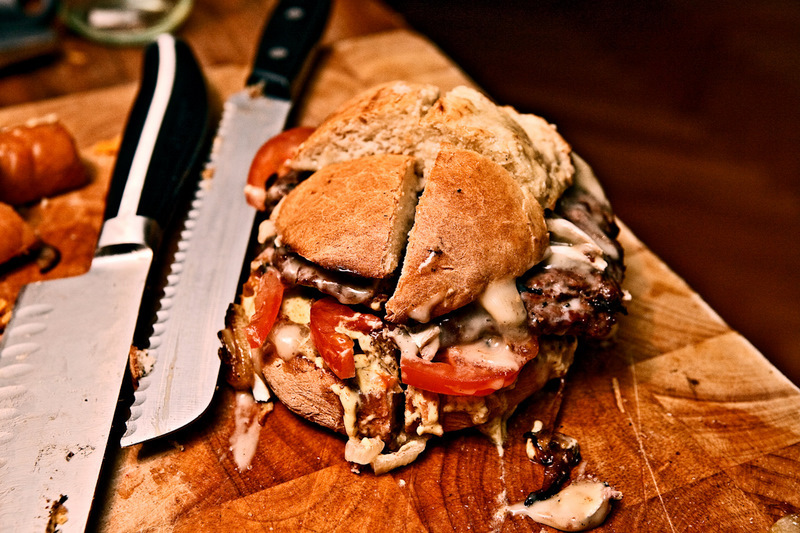 This amazing hamburger was loaded with flavors. German bratwurst sausage, sauerkraut, spicy mustard. The recipe called for some cheese curds which we couldn't find so we used massive amounts of the yellow cheddar in it stead - which was really delicious. The Camelot -, nr 16 "..treat her right and she´ll return the favour tenfold". Last, but not least, was the Camelot. It was endowed with pungent french Camembert cheese, some fried mushrooms, caramelised onions, hot Dijon mustard and some tasty peppery bacon. At that point - we were getting really packed - so this one had to be gently force down - but down it went! It was that good that a stuffed stomach couldn't resist! And praise to the man of the evening - Kristinn Gretarsson - what a performance. The food was stunning and the company was even better. I think we made hamburger - at least cheeseburger history. Long live the hamburger! Let's eat, drink and be merry - Bon appetit! Sweet mother of mercy, þetta er svo ótrúlega girnilegt! Hello - Axel - Indead this was a feast to remember!